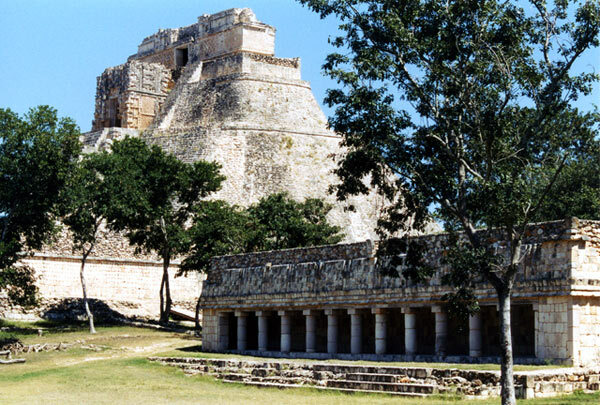 Uxmal is located in the Santa Elena Valley to the south of Puuc hill country in the southwestern part of the Yucatan Peninsula in Mexico. The zone was first settled in 500 B.C., but it wasn't until the ninth and twelfth centuries A.D. that it became the seat of the Mayan Political and economic power in the Puuc region. It is estimated that a population of around twenty-five thousand inhabitants was distributed throughout a territory of 37.5 square kilometers with enormous agricultural potential, but lacking in permanent water sources. For this reason the Maya constructed chultunes, or underground cisterns, and a complex drinking water system, including aguadas and bukteoobob for the utilization of rainwater. The architecture at this site is one of the most authentic examples of the Puuc style. Decorative features such as the three-dimensional masks of the god Chaac, colonnades, the two-headed jaguar, and other iconographic symbols demonstrate Uxmal's position in the most important cultural and commercial circuits of the Maya Classic Era. The walled civic-administrative area occupies an area of one kilometer from north to south and .6 kilometer from east to west. The palace-type structures are arranged around courtyards, forming quadrangles. The decoration is among the richest and most varied of all the archaeological zones, including representations of gods, animals, dignitaries, and geometric forms. There are also residential structures in the surrounding area.